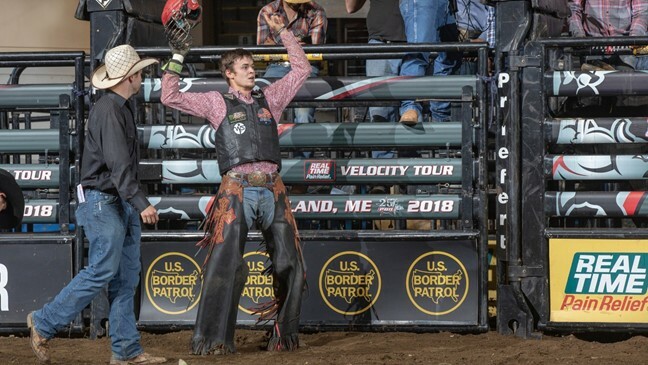 PORTLAND, Maine – Inside Cross Insurance Arena, Eli Miller (Statesville, North Carolina) earned the win on the opening night of the PBR (Professional Bull Riders) Real Time Pain Relief Velocity Tour (RVT) Portland Chute Out in Portland, Maine. The 21-year-old led the way in Round 1, covering Who’s Knockin (J Bar W) for 86 points. In addition to the round win he earned $800 on the night. Finishing in second place was Andrew Alvidrez (Seminole, Texas) who conquered Hair Trigger (Mike Miller Bucking Bulls) for 84.50 points. Michael Lane (Tazewell, Virginia), the current No. 1 rider in the RVT standings, was the first rider out of the gates on the night and was the first rider to tally a score. Lane rode Fox Hole (Cornwell Bucking Bulls) for 84 points and finished in third place on the night. Brazilian Paulo Lima (Bezerros, Brazil) finished fourth after covering Silver Select (Mike Miller Bucking Bulls) for 83.5 points. Rounding out the Top 5 was Stormy Wing (Dalhart, Texas) who’s 81-point trip on Darlin (Mike Miller Bucking Bulls) snapped a 10-out buckoff streak. The Portland Chute Out continues tomorrow night at Cross Insurance Arena at 7:00 p.m. The top riders on the Real Time Pain Relief Velocity Tour will all get on more bull before the Top-10 in the event move onto the championship round. Fans will be able to watch all the Round One action from Portland beginning tomorrow at 8:00 a.m. on RidePass.com.